A night guard is a dental appliance prescribed to patients who suffer from teeth grinding (bruxism) or teeth clenching. When a patient is prescribed to wear a night guard, there are three options: he can get an off-the-shelf mouth guard, usually from a pharmacy; he can get a boil and bite guard, which as the name suggests can be heated and molded to fit the teeth; he can also get a night guard made at a professional dental lab, which is an appliance that is fabricated by first taking an impression of the teeth, making a dental cast, and then creating the customized guard. It should fit perfectly: it should have a snug fit and should not rock. 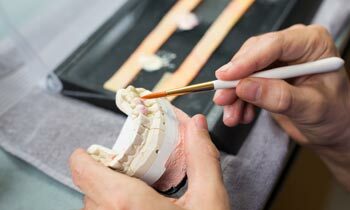 One very important benefit of a lab made night guard is that it is made from an exact impression of patient’s mouth so the fit is superb. It should settle comfortably in the mouth and not put pressure on the soft tissue, bones and teeth. A night guard is most effective when it is worn as prescribed and having a comfortable fit makes the night guard easy to wear. It should provide perfect protection to the patient’s teeth and jaws. Due to the perfect fit and coverage that a custom fitted night guard is able to offer, you can trust that it will not only be able to serve its function, but it will do its job without damaging the structures of the mouth. The coverage of the materials extends and sits on the teeth well so that it does not disrupt the bite, while protecting the teeth and the gums. It should be durable: A night guard from a dental lab is more expensive than the ready-made and boil-and-bite guards. Some people may find it hard to justify the higher cost, but those who understand how important a night guard is in protecting your teeth and preserving you oral health will agree that it’s well worth the price.. Now, understand that when you opt for a night guard fabricated in the dental lab, you can enjoy reliable durability. The materials used in the fabrication of the night guards are more durable, so you may be paying for more, but what lab made night guard is longer lasting. In the end, the investment you make is well worth it, since a good night guard will save you from long-term damage to your teeth and expensive oral surgery and invasive operations later. It is perfectly customizable: When you purchase commercially sold night guards, these appliances can never rival your professionally fitted night guard, which is created from an exact impression of your teeth so you get a perfect fit. The fit will account for any irregularities in your teeth or in your bite. In addition, the lab made night guard gives you an option to choose the type of material: either soft, dual laminate or hard acrylic, depending on your teeth grinding severity. You can get the benefits of a professionally made custom night guard by ordering online at ProTeeth Guard.com. We offer the same professional, dentist quality custom night guard without the expensive markup you would pay at the dentist.